Includes my short story, Ethical Override, originally published in The Robot Chronicles. 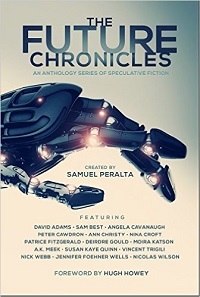 The Future Chronicles – Special Edition includes fifteen stories, selected and new, from some of today’s best writers in speculative fiction. It includes ten selected stories from some of the Chronicles‘ popular titles – Robot, Telepath, Alien, and A.I. – to give new readers a taste of the series; and includes five completely new stories, first published in this Special Edition.